TAMPA, Fla. – Florida State doubled its NCAA Outdoor Track & Field Championships qualifiers on Day 2 of the NCAA East Preliminary, nailing down five more spots – three in the 100-meter dash and two in the women’s discus – on Friday. Junior Andre Ewers found another gear, launching himself onto the world stage, with a stunning 9.98 quarterfinal 100-meter dash performance to lock up his first trip to Historic Hayward Field. Ewers’ mark is the fastest legal time by a collegian this year and ranks No. 2 in the world. Better still, he’ll have a running mate for the June 6-9 meet in Eugene, Ore. Junior Darryl Haraway, running two lanes to Ewers’ right, laid down a monstrous personal-best of 10.09 to secure his first individual event NCAA Championships berth. Ewers and Haraway now occupy the Nos. 5 and 9 spots on FSU’s prestigious all-time top 10 list. It was an especially gratifying performance for Haraway, who was making his first NCAA East Preliminary appearance in the 100 after injuries relegated him to relay duties as a freshman and sophomore. Haraway matched his collegiate-best (10.32) at the National Relay Championships last month, his first 100 since early April in 2016, then followed with a third-place finish at the ACC Championships two weeks ago. After qualifying 19th with a 10.33 in Thursday’s first-round race, the Upper Marlboro, Md. native blitzed his previous lifetime-best of 10.20, set in victory as a high school junior at the 2014 New Balance Nationals title. It was that year’s world youth-leading time. 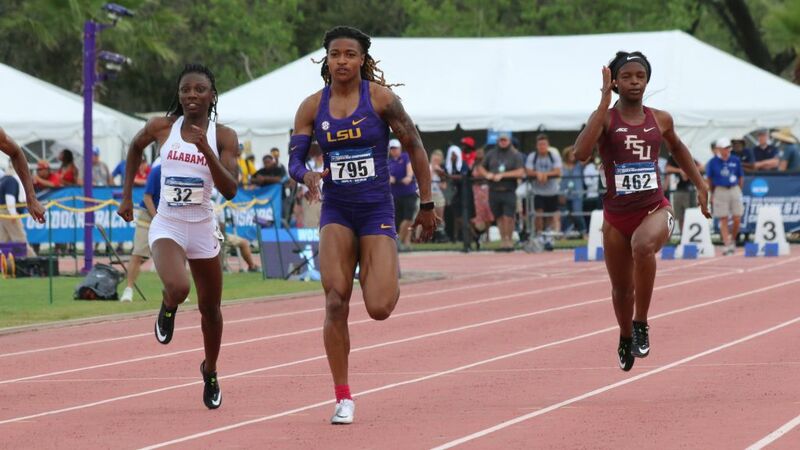 Freshman Ka’Tia Seymour followed up her school-record 100-meter performance in Thursday’s qualifying time with a strong 11.17 to qualify eighth overall for the NCAA Championships against a blazing field. Jayla Kirkland turned in an all-conditions best of 11.24 (+2.8), but came up one one-hundredth of a second shy of nabbing the 12th and final qualifying position. Shauna Helps matched her personal-best of 11.26 and was 16th. “All of our 100-meter ladies competed well; two lifetime bests and a near best for Ka’Tia is more than a coach could expect,” Braman said. The sprinters were finished, turning their attention to the first round in the 200-meter dash. Ewers, the lone men’s competitor in the first round of the 200, he won his heat in a controlled effort, advancing to the quarterfinals in 20.28. The fourth-fastest in the field of 48, he recorded his first wind-legal time of the season, which was good enough to lodge the No. 7 mark in program history and nudge Ron Harrison (20.54) from the top 10. Harrison had been entrenched since 1960; the longest standing mark in any event in FSU history. With the wind whipping up and a storm bearing down, the women took care of first-round business as Seymour (22.57w), Kirkland (22.93w) and Helps (23.05w) all advanced to Saturday’s quarterfinal round. 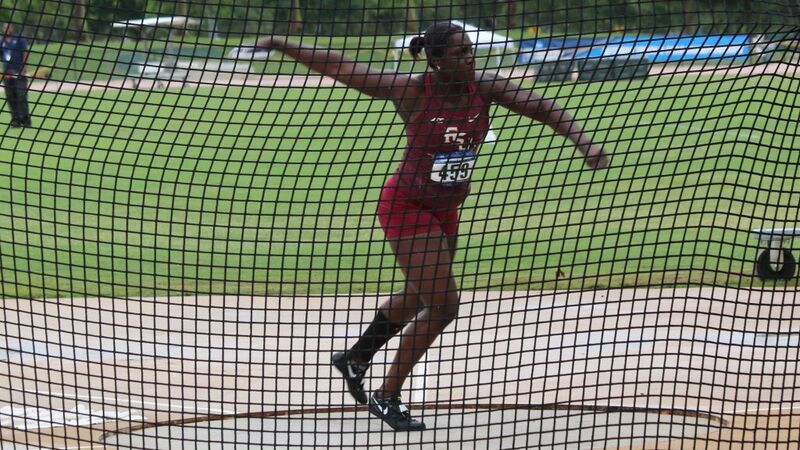 Shanice Love and Ieva Zarankaite had to wait out a lengthy weather delay before they could begin their third and final flight of the discus competition. The Nos. 1 and 4 seeds, respectively, did not disappoint, easily qualifying with marks of 55.17 meters (181-0) and 52.47m (172-1). The duo pushed the total of women’s throwers headed to Eugene in five, in three events, with Zarankaite also qualifying in the shot put alongside Gleneve Grange and Lauri Paredes advancing in the javelin. The Seminoles will close out the competition Saturday with 13 more qualifying opportunities. 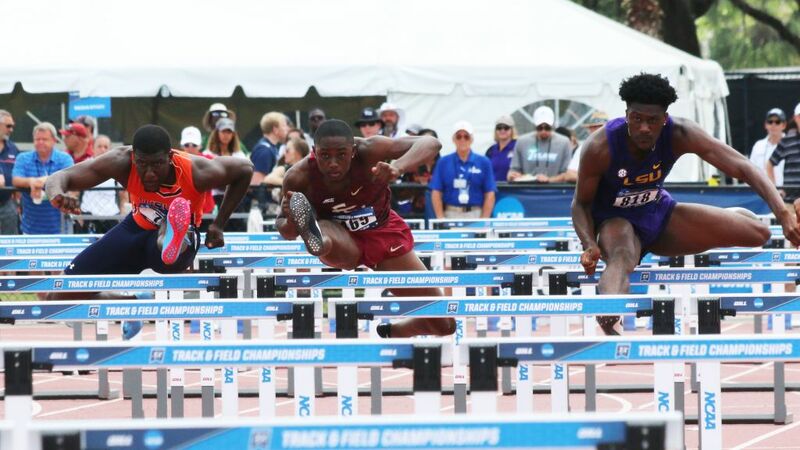 Friday’s first-round hurdles races produced a trio of qualifiers as freshmen Trey Cunningham and Tyricke Dickens advanced to the quarterfinals in the 110-meter hurdles, while Cortney Jones moved on in the 100-meter hurdles. Cunningham qualified sixth-fastest in 13.65 (+2.1), while Dickens laid down an all-conditions best of 13.91 (+2.6) to qualify 17th. Jones cruised to a heat victory in 13.10; seventh-fastest from the field of 48. Saturday’s schedule will begin with the men’s and women’s 4×100 relays at 12:30 and 12:35 p.m., respectively, followed by the hurdles quarterfinals (1:35 and 1:50) and the 200 (2:05 and 2:20). Corion Knight will hunt a trip in the men’s high jump, where he is the No. 8 seed, beginning at 2 p.m., while men’s triple jumpers Armani Wallace and Montel Nevers, seeded fifth and 13th, get underway at 3:30. Senior Austin Droogsma carries the No. 3 seed into the men’s shot put at 5:30 p.m.